Better late than never, right? I’ve mentioned before that our wedding invitations were one of my main focuses in planning our wedding. They were a huge undertaking and they were one of my favorite things about the wedding, so I had to share them with you at some point! I took these photos yesterday, which are far from perfect, so over six months after the fact, the invitations have seen better days at this point. But here they are! 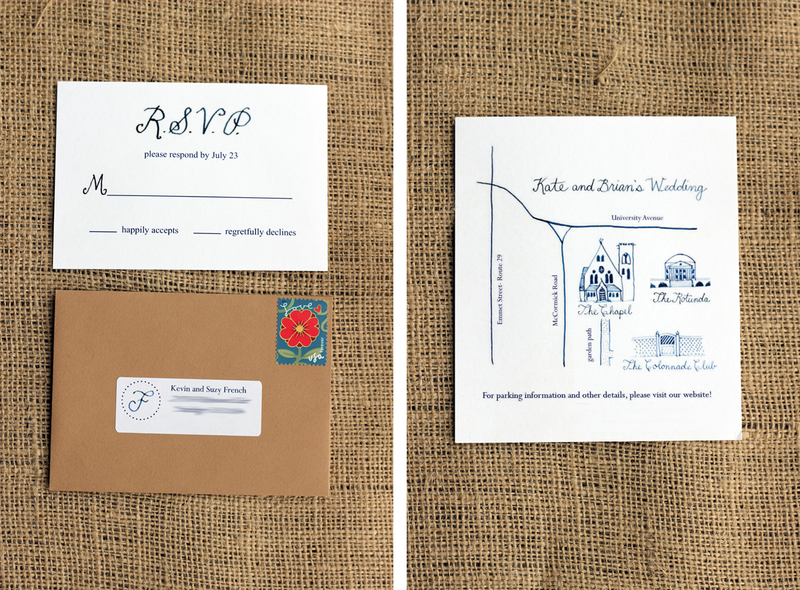 I designed all of the elements of the invitation suite, and then ordered the printed elements and the paper from Cards and Pockets, who I really can’t recommend enough. If you are a long time reader you might remember that I had our invitations sent to my old apartment in Charlottesville by accident. Cards and Pockets was really helpful as I was freaking out over their online chat service. I’ll try to keep the “How I did it” part of this post short, because I could go on and on, and you probably aren’t that interested. Basically if it looks like handwriting or a drawing, I did it on paper with a calligraphy pen and indigo ink, and then photographed it and photoshopped it. I was able to make sure everything was reproduced and looked how I wanted it to that way. Looking back that probably wasn’t super efficient, but knowing what I know now about graphic design and whatnot, I’m actually impressed that they came out as good as they did. I still love them these many months later. The only things that we printed ourselves were the address labels for the RSVP envelopes, and the little monogram that went on the belly band of the invitation. The monogram and the silhouettes (which I also did myself in Illustrator) were used on tons of details throughout the wedding. Assembly was a HUGE ordeal. My mom, mother-in-law, sister-in-law, and brother’s girlfriend were SO helpful. I did the calligraphy on all the envelopes by hand, and I also embossed the return address emblem, which was kind of a nightmare. That meant that all the assembling of the folders, belly bands, stuffing envelopes, and sticking postage was left to my “team,” and I can’t thank them enough. Whew! Sorry that was so long. If you’re looking for more of the wedding, here are the posts from Wedding Week. 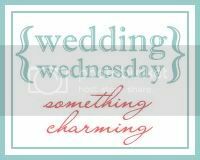 I’m linking up with Joelle today for Wedding Wednesday! Your invitations were gorgeous. Making ours was my favourite part of the planning process as well. I wish pinterest was around (or I knew about it) when I was planning. I hope you saved one as a keepsake? Your invitations are soo cute. Great job, we haven't even looked at invitations for ours yet. Baby steps lol. Oh my word, those are beautiful. I love the silhouettes. These are so sweet and lovely!!! Love them! Mine were kind of similar! We had our silhouettes on them as well.